This entry was posted in 1224 2WS, Historic radio, Personalities, Radio station, WS FM and tagged 2WS Conversion to FM, Aircheck, Announcers, Hans Torv, Kayley Harris, Steve Raymond, Sydney radio on May 16, 2014 by andrew. This entry was posted in Personalities, Radio station, WS FM and tagged Aircheck, Nic Bennett, Sydney radio, WSFM on February 24, 2014 by andrew. This entry was posted in 70's radio, Andrews Legends on the Mic, Personalities, Radio station, WS FM and tagged 4MK, 70'S, Aircheck, Jim Dolan, Jonesy and Amanda, Mackay, Sport, Sydney radio, WSFM on January 28, 2014 by andrew. This entry was posted in Radio station, WS FM and tagged Aircheck, Announcers, Guests, Jimmy Barnes, Jonesy and Amanda, Rock legend, Sydney radio on April 16, 2013 by andrew. 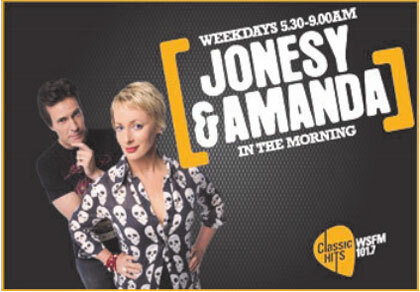 This entry was posted in Personalities, Radio station, WS FM and tagged 2013, Aircheck, Announcers, Classic rock, Jonesy and Amanda, Sydney radio, WSFM on April 4, 2013 by andrew. This entry was posted in Personalities, WS FM and tagged Jonesy and Amanda, WSFM on March 11, 2013 by andrew. This entry was posted in Personalities, Radio station, WS FM on March 4, 2013 by andrew. This entry was posted in Radio station, Uncategorized, WS FM on January 27, 2013 by andrew. This entry was posted in Jingles, Personalities, Radio station, WS FM on November 25, 2012 by andrew. This entry was posted in Personalities, Radio station, WS FM on November 22, 2012 by andrew.